These are a variety of images I have collected of Barney Oldfield over the past few years. 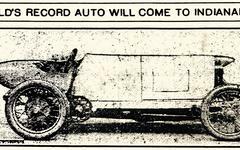 The preponderance of them are of him in some of his most famous machines, the Cooper-Ford "999," the Winton Bullet II & III, the Green Dragon cars and his Lightning (Blitzen) Benz. Some of the images involve other important figures from the early part of his career, such as Tom Cooper and Alexander Winton.